As you enter the home, the first thing that catches your eye is the wall of aluminium beams that run vertically beside the stairwell. Mark points out that there are no fixings to be seen anywhere and, while that made the job trickier, it’s worth it for the effect. Another standout feature is the contrast between the white frontage and the dark stained cedar cladding at the back of the house. Inside there’s a vertical gap where one ends and the other begins, demarcated with a strip of LED light – a real talking point when switched on at night. This creative lighting scheme and the expanses of white wall meant the house called for a flawless finish on the walls. This required extra care and attention from Lance Ash Interiors who installed the ceiling battens and insulation and completed the Gib stopping and finishing throughout the home. The company provides a complete range of interior wall lining services which made the process hassle free for the clients who were very happy with the high-quality finish. The downstairs is made up of the light and airy open-plan living, dining and kitchen area and a separate lounge and play area for the children. The large island in the centre of the kitchen includes the sink so that the cook can enjoy the view out onto the deck. The benchtop is engineered stone, manufactured and installed by Shane Boyd Granite Benchtops. The oak veneer cabinetry in the lounge and combination of oak and acrylic cabinets in the kitchen were constructed by Advanced Joinery who were contracted to supply all of the joinery for the home including wardrobes, vanities, laundry cupboards and even the day bed in the upstairs sitting area as well as exterior joinery. Upstairs in the master bedroom the owners opted for a walk-behind wardrobe rather than walk-in. The effect creates a headboard rather than a wall, meaning the room is not cut in half while still offering a practical, hidden storage solution. The ensuite bathroom features a textured tile giving the walls the appearance of twill fabric, an unusual and elegant touch. 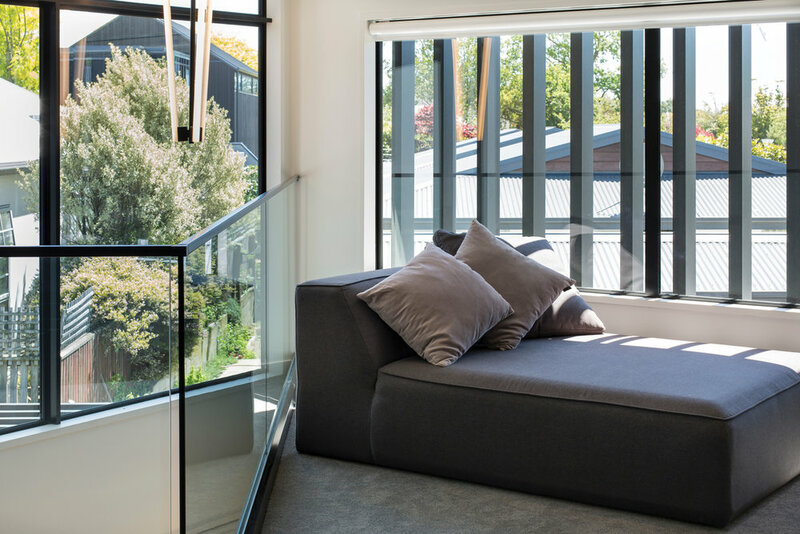 The rest of the floor comprises two more bedrooms, a family bathroom and the sun-soaked mezzanine sitting area, perched so that you can look down into the dining area. As well as the attention to detail needed by Mark Sutton and his team on the interior, there were challenges outside too – requiring Mark to get his calculator out to work out the angles that are pivotal to the design. He and his team also constructed the deck and all of the hard landscaping features including the outdoor fireplace surround. To complete the exterior, Mark called on a longstanding relationship with Tyson from TK Plastering, bringing him and his team in to apply the exterior finishing. Using Resene Construction Systems’ Rockcote and plasters systems they applied Integra 50ml AAC panel and acrylic plaster, finished with Resene paint creating a stark white contrast to the dark timber cladding. “The design of the house is amazing,” says Tyson. For Mark, even more so than seeing the completed house, handing over the keys to a happy homeowner is the reward at the end of a challenging job. And in this case, the family were over the moon with how the architect and building team made their plans for the site come together into a family home to be proud of.